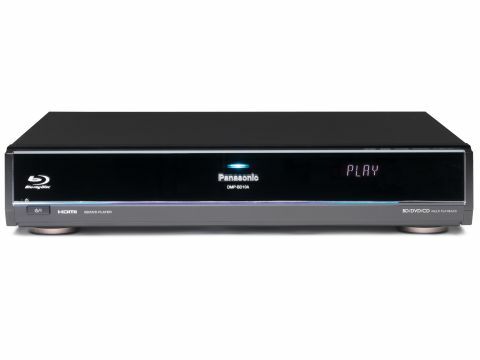 When we tested Panasonic's original Blu-ray player, the DMP-BDP10, we were blown away by the excellence of its hi-def picture and PCM sound quality. This version is physically identical to its predecessor but has been upgraded so that it can handle Dolby TrueHD and DTS-HD High-Resolution soundtracks, the latter of which is used on all Fox Blu-ray discs. Other improvements include playback of AVCHD DVDs, the HD format found on some camcorders and Viera Link, which means you can control several Panasonic components with one remote handset, and a seamless multiple component menu screen. The only other difference of note is a £300 price reduction, which improves the value rating marginally. It's all well and good so far, but Panasonic hasn't gone far enough in our eyes with the specification. The absence of an Ethernet port means this player will never be able to access online interactive Blu-ray content (then again, there aren't any BD Live discs yet, but this could just be a chicken and egg situation). Ideally, we'd also like to have seen a 1080p/24Hz mode, since nearly all Blu-ray discs are mastered in this format. The DMP-BDP10A converts the frame rate of 1080p material to 60Hz, which can lead to motion judder. At least the deck doesn't have to upconvert from 1080i to 1080p, like the Samsung BD-P1000. Other features carried over from the original deck include CD playback, upscaling of regular DVDs (to 1080p) and DVD-Audio playback, plus DTS HD and Dolby Digital Plus decoding. To get the most out of the picture, Panasonic has thrown a raft of picture processing into the fray, including Pixel Precision Progressive Processing, automatic 3:2/2:2 pull down progressive detection and processing, and 16-level Motion detection. It pays dividends on our Blu-ray test discs, delivering sumptuous images that simply demand a large screen - 37in at least. The extra detail that is presented onscreen compared with DVD is often mesmerising. Subtle colours and extra detail bring a lifelike quality to skin tones, and the effect is of a living, breathing, near three-dimensional picture. Audio is unarguably superior to bog standard DVD too, with clearer, more expansive and engaging soundtracks generated from the best Blu-ray discs. Minor niggles include the failure to provide an HDMI cable and a rather slow initial disc-loading process of around 30 seconds. It's tough to argue against that incredible picture, of course, but it is also tough to swallow that hefty price tag when HD DVD is so much less expensive and LG's dual-format deck is only £100 more.